They vary in difficulty and popularity, but each offers incredible beauty. 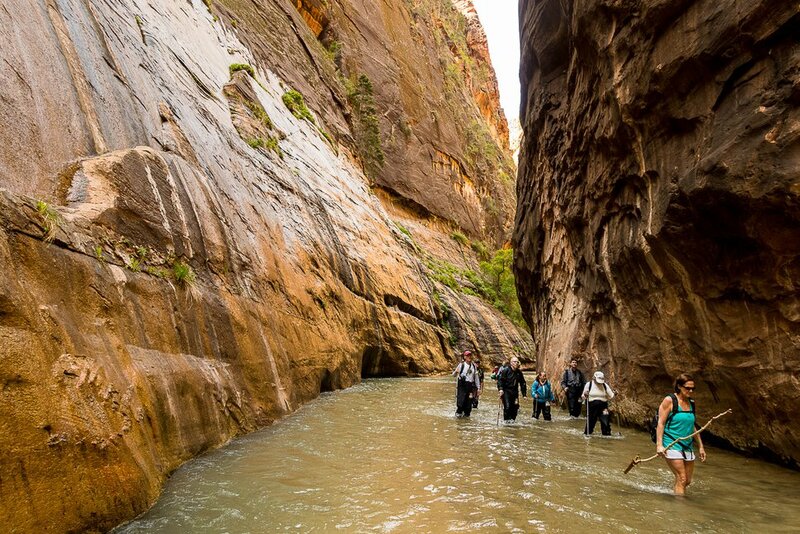 From sweeping vistas to dark canyon narrows, the hikes of Zion National Park are routes to extremes. Some are easy strolls, suitable for toddlers. Some can be downright deadly if you don't handle yourself with care. Some are so heavily used that hiking them can feel a bit like a mall on Black Friday, while others take you to total solitude. But in Utah's most visited national park, pretty much every hike is a path through astonishing beauty. The hard part is deciding where to go. 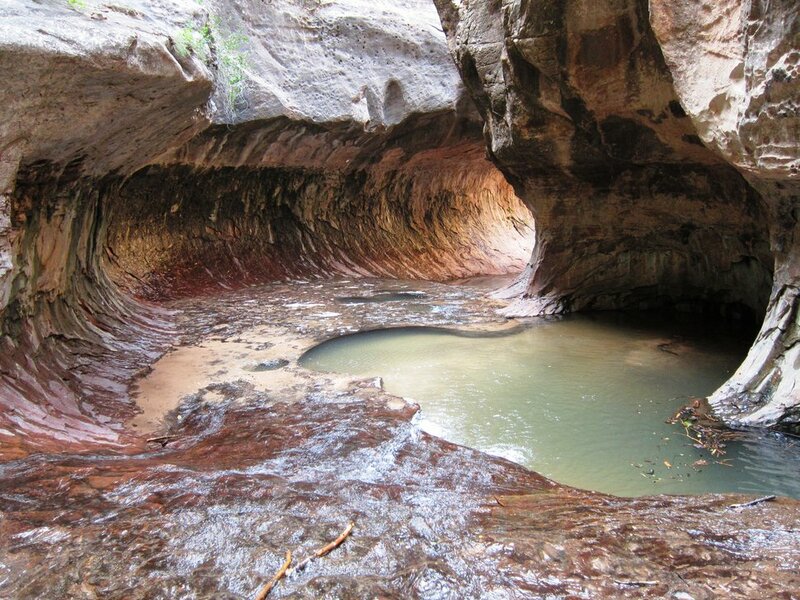 To that end, The Tribune's hikers have identified five favorite hikes in Zion. Trent Nelson | The Salt Lake Tribune Hikers in the Narrows, Zion National Park, Wednesday May 6, 2015. This is why you go to Zion. The canyon walls tower hundreds of feet over the river, casting an orange glow over the shadowy, atrium-like passage. 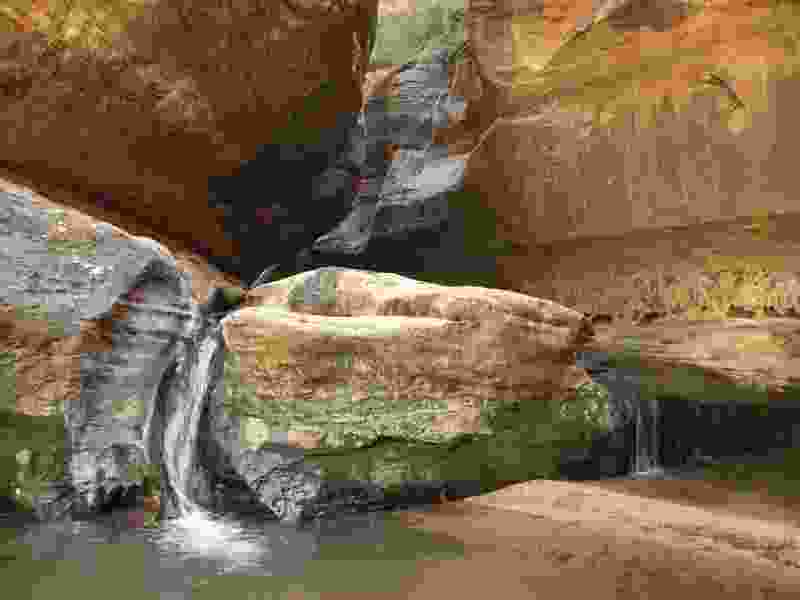 It is cool in summer, the river wading is fun and it's among the most unique places to be found in any national park; the only drawback is that nearly everyone else in Zion agrees. Be gentle with your neighbors, especially as you negotiate the wet boulders. Hiking poles are invaluable here. The hike begins at the Temple of Sinawava trailhead. Take the paved Riverside Walk until it ends after a mile. Get into the river and head upstream to the Orderville Canyon confluence, 2.5 miles from the trailhead. Al Hartmann | Tribune file photo Hikers carefully make their way up a section of the Angels Landing Trail in Zion National Park in March 2009. The trail offers one of the premier hikes in the park, taking visitors along a steep rock spine that climbs to a magnificent view of the Virgin River and Zion Canyon below. But the hike is not for those who fear heights. An anchor chain is embedded in the rock in steep places along the trail for hikers to grab onto for safety. 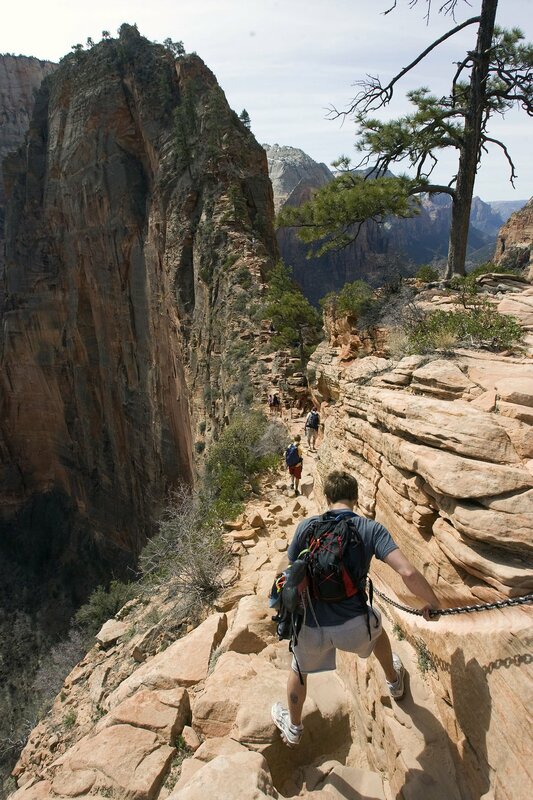 Woe to the acrophobe who treads upon Angels Landing — the Grand Poobah of Zion's trails, higher than the condors. The topography is so dramatic and the views so comprehensive, you feel like a miniature in a diorama. But this hike is not for everyone. The final half-mile crosses a knife-edge ridge with drop-offs of about 1,000 feet. You can scope out the terrain from the flat area near the start of the spine, where many people end the hike. 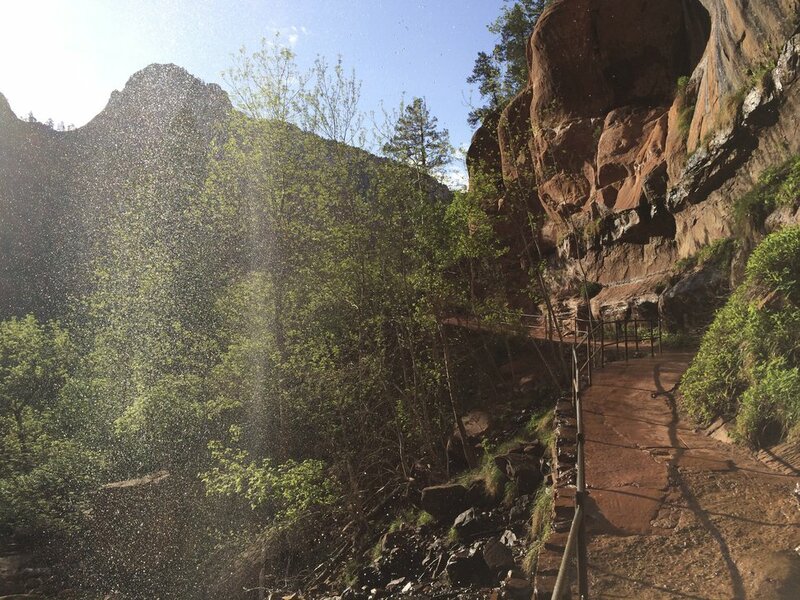 The hike begins at The Grotto trailhead in Zion Canyon. In high tourism months, the trail is quite crowded and can be slow-moving along the spine. Lindsay Whitehurst | Salt Lake Tribune Emerald Pools hike. A family hike through a lush oasis with waterfalls and red rock formations? Yes, please. This is a Zion classic. There are three levels of pools. The hike to Lower Pool is about 0.6 miles on a paved trail with a gentle incline. After that, the trail is unpaved and zigzags up to the Middle Pool and its views of Cathedral, Lady and Red Arch mountains. The narrowest, steepest part goes to Upper Pool, about 1.1 mile from the trailhead, with a total elevation gain of about 400 feet. The hike begins at the Zion Lodge trailhead. (Courtesy of Craig Buschmann) The hike along the Middle Fork of Taylor Creek leads to an alcove in the quiet Kolob Canyons section of Zion National Park in Utah. Photo taken August 2013. The Kolob Canyons area presents a totally different side of Zion from the crowds and cliffs of Zion Canyon. Here, the scenery is greener, the wildlife abundant and the human impact diminished. The Middle Fork of Taylor Creek offers a gentle, mostly shaded hike through nature to an enormous red-rock dome, known as Double Arch Alcove. It is an excellent respite during summer's heavy tourism. The trailhead is 2 miles northeast of the Kolob Canyons Visitors Center on Kolob Canyon Road. Be ye afeared, o fools of Zion who attempt yon serpentine and shadowed depths of North Creek's Left Fork ill-prepared. Be warned! Let not the meager slope incline deceive; this hike's a gorgeous beast of slick rock, red and perilous, up rushing streams and paths unseen through foliage thick and boulders tall. But, lo, above cascades and tiers of stone, tall canyon walls curl 'round a cool retreat with streaks of green arising from the floor, and darkened corridors to shade your thoughts as you return the way you came — lest now the fiery sun of afternoon should sear in memory a strangling thirst, a sprain, a gasping climb, no comforts soon in reach. You'll always have a keepsake in your mind of paradise you earned in fierce terrain. The hike to the famed, tube-like passage begins at the Left Fork trailhead on Kolob Terrace Road. You will need a backcountry permit to hike to The Subway. See details at nps.gov/zion/.